Just when you thought you had seen all the strangest collaborations going, Huawei and KFC have managed to up the ante to a level we never thought possible. For those unfamiliar with KFC’s history in China, the fast food outlet first opened in the country thirty years ago, and being the first Western fast food outlet to do so has left KFC in a unique situation. The people of China love them some fried chicken, and in order to celebrate the anniversary of the chain’s debut in the country, Huawei has created a special smartphone, complete with KFC branding. We checked – it isn’t April 1st but alas, this thing is 100% real and we think someone somewhere might even buy it, too. 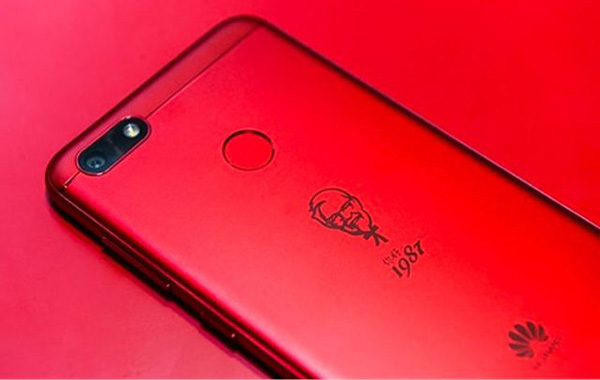 While neither Huawei nor KFC have announced exactly what this phone will have on the inside, the outside comes with a bright red finish just as you might expect, and is embossed with Colonel Sander’s face just to make sure that you are under no illusions that you are walking around with a KFC advertisement stuck to the side of your head. Software-wise, it’s all KFC, all the time with KFC delivery bloatware included, meaning you will be able to order chicken to your home if you are in China, and there is also an app that allows users to choose what music plays when they are in a KFC store. It’s all, well, odd. But hey, who are we to question a good marketing ploy? We don’t yet know how much the device will cost or where it will be sold, but the smart money appears to be on it being distributed through Alibaba’s TMall, given it already has a relationship with the fried chicken company. That is the weirdest thing I saw so far here on Redmond pie. Like wtf. It’s all over for Apple now.